Based on their current form the Melbourne Renegades look good enough to beat Sydney Sixers in the encounter. Melbourne Renegades sealed the last semi-final spot up without much ado. As the Adelaide Strikers lost to Perth Scorchers in a do-or-die clash for both teams. This loss ensured Scorchers can no longer finish with more than 14 points. With the win against Hurricanes, the Renegades rose to 15 points with one game still to be played. They have won five of their last six matches and in this form and they would want to defeat the Sydney Sixers. The Renegades are expected to finish at No.4 irrespective of the result of this game. However, winning here will help the Melbourne franchise dent the Sixers’ chances of finishing on the top. The Renegades will have better chances of winning the semi-final if they play a handicapped Sydney Thunder instead of Sixers. 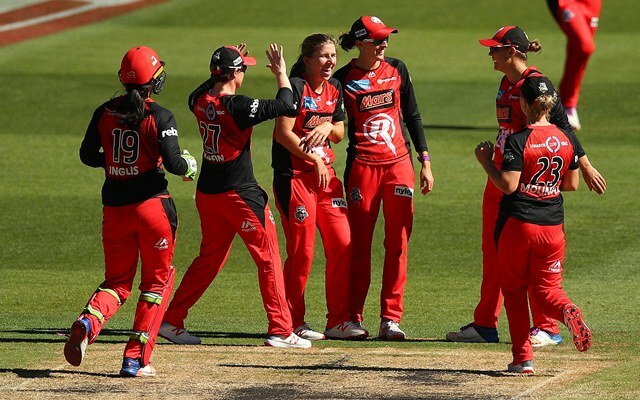 The 55th match of the Women’s Big Bash League (WBBL) will be played between Melbourne Renegades and Sydney Sixers at the Simonds Stadium in Geelong. The match starts at 2:50 PM local time (3:50 AM GMT) (9:20 AM IST). Streaming of this game will be available on cricket.com.au, Cricket Australia Live apps and WBBL Facebook Page. The Simonds Stadium in Geelong hosted only a Women’s T20I in 2017 and two WBBL games. In T20I between Australia and New Zealand, the hosts were reduced to 61/9 in 13 overs in response to New Zealand’s 101/9 from 20 overs. The WBBL game in 2018 was slightly better as it witnessed a tie with both the teams matching each other at 120. The game between Renegades and Hurricanes played this season was also a low-scoring one. Amy Satterthwaite (C), Maitlan Brown, Zoe Cooke, Jess Duffin, Claire Koski, Erica Kershaw, Emma Inglis, Anna Lanning, Sophie Molineux, Molly Strano, Lea Tahuhu, Georgia Wareham, Courtney Webb, Danielle Wyatt. Ellyse Perry (C), Sarah Aley, Erin Burns, Lauren Cheatle, Ashleigh Gardner, Alyssa Healy, Jodie Hicks, Marizanne Kapp, Sara McGlashan, Hayley Silver-Holmes, Lauren Smith, Dane Van Niekerk, Tahlia Wilson. Sophie Molineux in current form is a more valuable player than Ellyse Perry. The all-rounder scored 285 runs in 12 innings this season with 2 fifties at 28.5 and bagged 14 wickets from 12 matches at an average of 20. 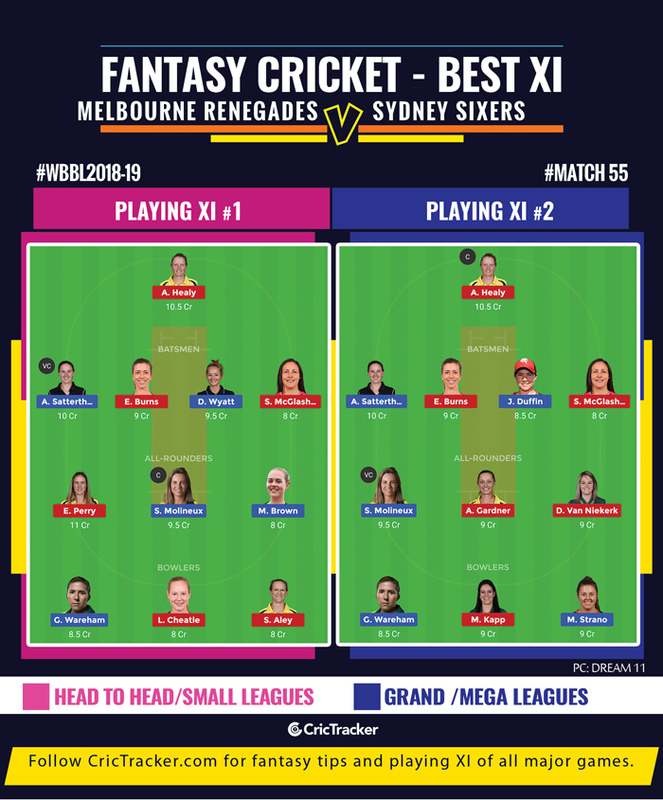 Sophie Molineux will be the first player to be chosen for multiplier in almost every fantasy players’ XI along with Ellyse Perry. The likes of Alysa Healy and Amy Satterthwaite can be considered for vice-captain role. Maitlan Brown also makes a case with her recent form. The likes of Sophie Molineux and Ellyse Perry could make things confusing for the ones who are interested in picking Ashleigh Gardner and Dane van Niekerk. Unless one is willing to take the risk of dropping Perry, neither of the Sixers’ all-rounders can be picked due to the lesser credits available.